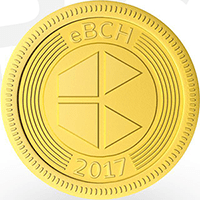 The EBCH - eBitcoinCash crypto currency was released on 17th November, 2017 and runs without any monetary authorities. EBCH, a decentralized digital coin, is not mineable, therefore in order to acquire EBCH, you are able to buy from a cryptocurrency exchange service. eBitcoinCash are on social network sites such as Facebook and Telegram, so check them out to stay updated with the latest news. We don't have any exchanges listed for eBitcoinCash yet, check back soon! We don't have any wallets listed for eBitcoinCash yet, check back soon! We don't have any debit cards listed for eBitcoinCash (EBCH) yet, check back soon! We don't have any price charts listed for eBitcoinCash yet, check back soon!